You may remember that after 9/11, some women in the US who wore headscarves removed them to protect themselves from abuse in the streets. As someone who does not believe wearing a headscarf is “required” or an obligation in Islam, I choose to wear it anyway. I’ve written about that before and won’t repeat here. When I fear for my safety while traveling, I wear a hat or a wool cap sometimes and it helps. I occasionally wear a hoodie for vconnecting sessions just coz I’m already at home wearing it so I just cover my head with it instead of getting a scarf. I noticed my friend Parisa Mehran does both these things. She is from Iran but lives in Japan. 1/ When those painful #UKvisa rejections happened, right after a month when I was called a terrorist by a colleague, I became too aware of my nationality, race, and physical appearance, & everything suddenly became so dark in my life. 3/ To me, the offline conferences are not safe anymore. I'll be at EUROCALL2018 soon & I'm so happy that if I find the on-site atmosphere unfriendly, I have VC sessions to attend. You, and your team, are democratizing conferences & I'm so lucky to know you. And in that moment I remembered the value of a totally secular reason why I continue to wear hijab. I wear it mainly for religious reasons. But u also wear it to remind myself not to be vain. And to keep a part of my identity clearly Muslim/Arab. Parisa’s tweet made me realize how… I could have been the same me, doing all I do, facing all my challenges and finding ways to overcome obstacles, and yet if I wasn’t wearing a headscarf on the vconnecting Twitter account photo, she would not have had that immediate moment of recognition and imagined herself in this. It will never be my main reason for wearing it, but I am grateful for that photo and the powerful effect it had. (also when I present about vconnecting I like using photos that show the diversity of people who participate… So not just people who look like me….). Anyway. Back to the title of this post. There are two verses in the Quran only that mention anything about women’s clothing. One mentions covering bosoms with scarves (no mention of heads specifically, tho it is said the garment referred to is already a headscarf and the new thing was covering bosoms) and the other refers to wearing longer gowns. The latter has an interesting “reason” for why it’s a suggestion that the prophet tell his wives and other Muslim women to do so. All the different translations are here. The crux of it is to dress this way “so that they be known and not abused”. This has many interpretations but I am particularly interested in two dimensions of it. The first is that, in the age we live in, wearing a headscarf is no guarantee of protection from abuse and of course, can be the opposite as my first paragraph shows. And is indeed why many choose not to wear it who live in non-Muslim countries. And yet it allows the Muslim woman to “be known”, and that in itself is a reason why many continue to wear it in non-Muslim countries. To find each other and recognize each other. In solidarity. I honestly can’t think of anything more beautiful than this thread or this imagery right now. Sending love to both of you, Parisa & Maha! I don’t wanna make this bigger than it is because I always felt people were overly obsessed with what women wear (in general). 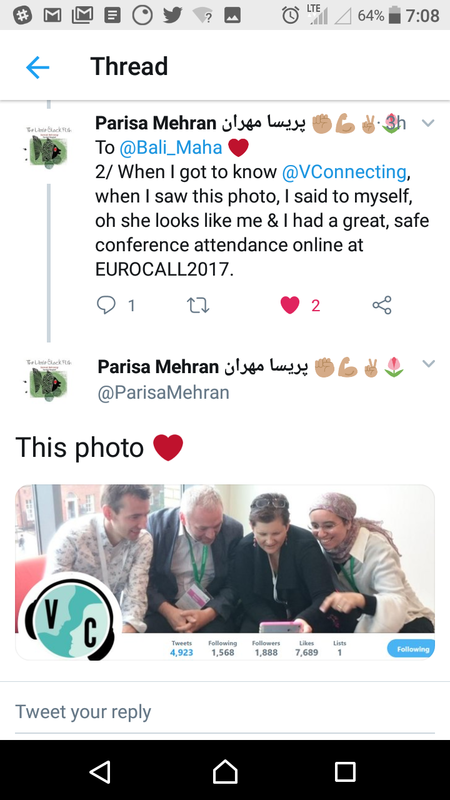 But I wanted to take a quiet moment and celebrate the moment Parisa became involved with vconnecting because it reminded us (as several of our team keep reminding me) of how what we do continues to resist exclusion and Gatekeeping in academic conferences (and borders). We are not more or less Muslim when we wear a headscarf of do not. But it does help us know/recognize each other… And that’s kind of a beautiful thing in itself. It hurts so much to read Parisa Mehran senses that “offline conferences are not safe anymore”. Sad and shameful. Here in Canada, discussions on issues related to head covering (or Islam in general) are too often characterized by ignorance and oversimplification. It’s so refreshing to read a perspective that is informative and nuanced. Thank you for sharing! In our little part of Canada with a 30%+ Muslim population, some women wear elaborate and formal looking scarves, wear practical coverings and many women go scarf free. Though it seems counter intuitive, “adherence to tradition” feels like a declaration of principled individuality and dignity in the self. Is it because in the more open Canadian culture you can choose who to be? Or maybe it’s our small town with a 125 year-old Muslim community?